There aren't enough food, service, value or atmosphere ratings for Te Amo Tequila Bar & Tacos, Connecticut yet. Be one of the first to write a review! Taylor a bartender is just phenomenal.It was refreshing that the bartender made the drinks strong and didn’t make y...I had the chorizo and he had the plantain and pork belly tacos.My tacos were delicious and I really enjoyed the guacamole. Pick one - Pineapple & black bean, Spicy mango, sasa roja or Salsa verde. 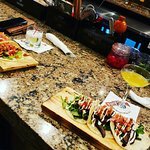 Modern Mexican restaurant & tequila bar serving delicious tacos and margaritas in a sophisticated atmosphere with two fully stocked bars, lounge area and dining room. OK, won't be rushing back. A very fun vibe to this joint. My son and I just went for the tacos and they did not disappoint. I had the chorizo and he had the plantain and pork belly tacos. Both were excellent, as was the service. Enjoyed! The guacamole was mediocre at best. The chips tasted like the frying oil was old and infused with other odd flavors. The pork tacos were cold and served on a single tortilla each. A second tortilla would have prevented them from falling apart. Get quick answers from Te Amo Tequila Bar & Tacos staff and past visitors.